Most figurative artists tend to have favorite subjects to portray, whether it’s people, still life, landscapes or animals. 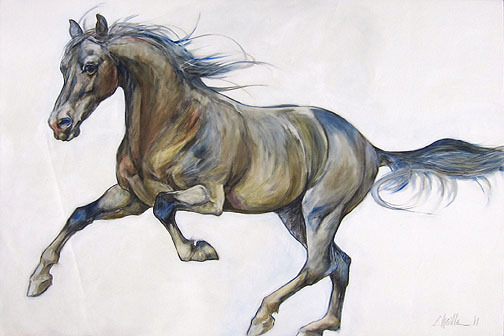 When the horse is the focus, it’s pretty certain that the artist who created that painting is an equine lover and a rider. It seems that the most beautiful horse paintings are done by people who are really passionate about these animals. 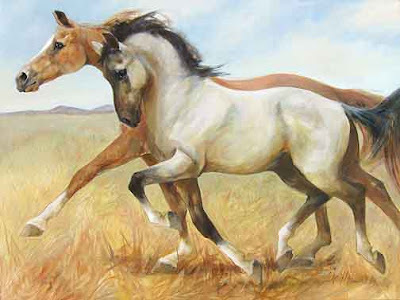 They ride all the time and know their horses so well, that they can really show their spirit and even their soul – just look at the eyes, and you will see an amazing sensitivity. Brusally Gwiazdor, at the gates of Brusally Ranch. 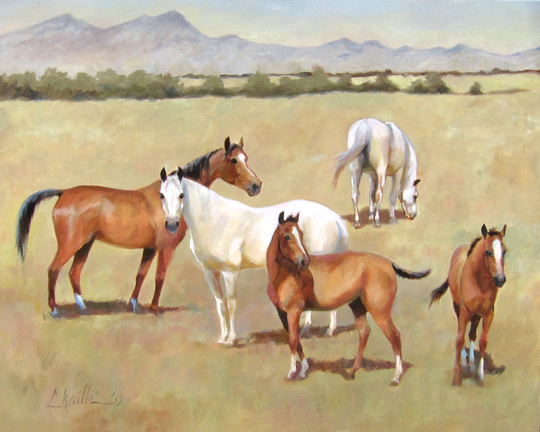 Chaille Trevor is equally committed to her horses and her art. She divides her time between riding and painting. 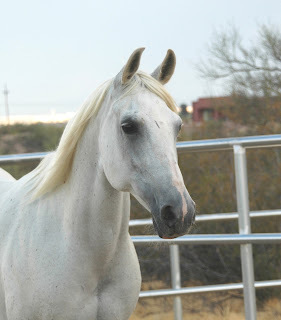 Chaille has a unique lineage in the horse world – her grandfather owned Brusally Ranch and was a major breeder of Arabian horses. He also was the creator, along with Anne McCormick and Philip Wrigley, of the well–known Scottsdale Arabian Horse show that will have its 58th annual show this February at West World. “My grandfather imported 26 Arabian horses from Poland, and I still have some horses from that breeding,” Chaille said. 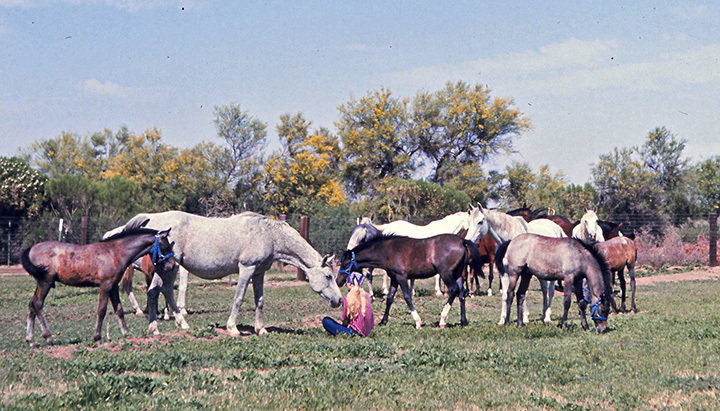 Chaille with some of her grandfather's imported Arabian mares. 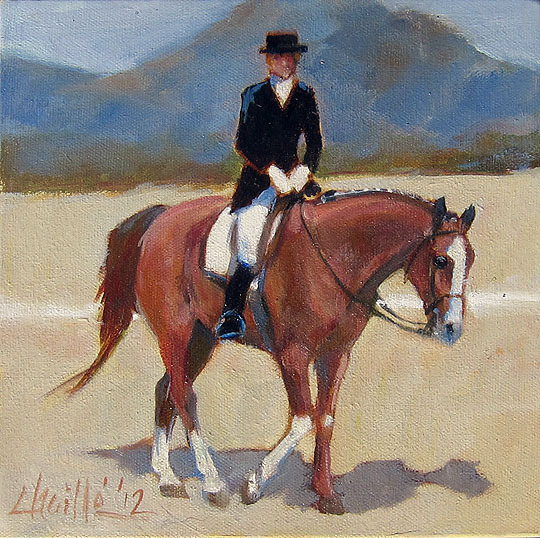 After getting an art degree at ASU, Chaille’s grandfather invited her to live and work at his ranch. She stayed there for 17 years, training and showing his horses. When I spoke to Chaille, I really felt that she has a deep connection to her horses. 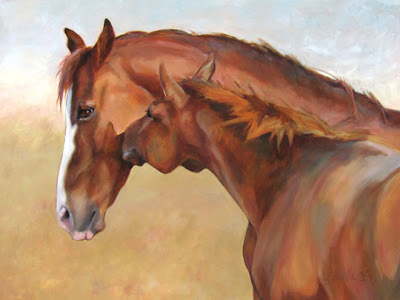 This special affinity is what gives her paintings their grace and energy. “Love,” a 36”x48” painting that was recently featured in Phoenix Home & Garden, depicts the close bond between a mare named Panatela and her little niece, Tess. Movement and energy are the themes in “Free Spirit,” The position of the horses’ legs, the way they hold their heads, and the dust kicked up defy the static limits of a painting, and they seem to come right towards the viewer. Chaille’s paintings have a sketch quality to them. She feels that technique enables her to “go deeper and deeper to get closer to what you feel about the subject and to express yourself.” “High Spirits” is a good example of this style. 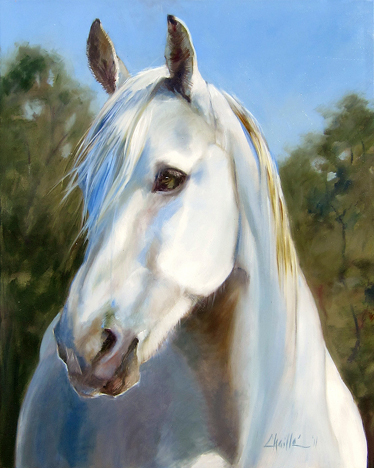 But I have to say that my favorite painting is “A Gentle Life.” When I look at this horse’s beautiful head with its soulful eye and delicate muzzle, I just want to wrap my arms around it. Chaille has spoken of her love for this horse to me through this painting. If you happen to be at the Wilde Meyer Gallery in Tucson, ask to speak to Betty Wilde. She’s a devoted horse lover, and would love to speak to you about the Wilde (Meyer) horses! Thanks to Tobi Lopez Taylor of Coronado Ranch Sport Horses for contributing photos and information to this post. Follow Brusally Ranch Appreciation Society on Facebook where you can learn a lot more about Ed Tweed's contributions to Domestic, Polish, and Russian Arabian horse breeding. 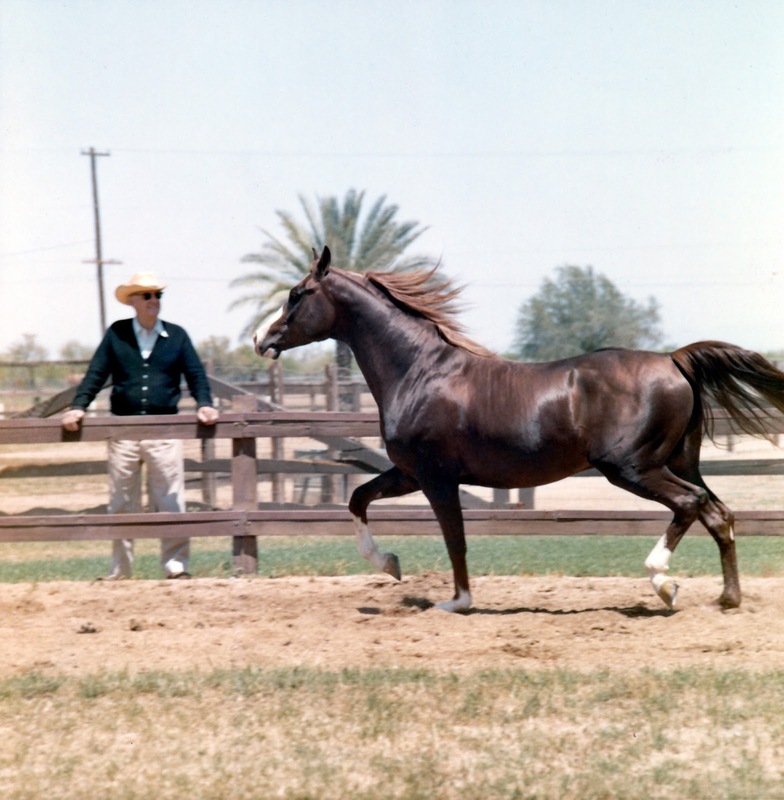 A book about Chaille's family's Arabian horse breeding program will be published by Screenfold Press in 2013. 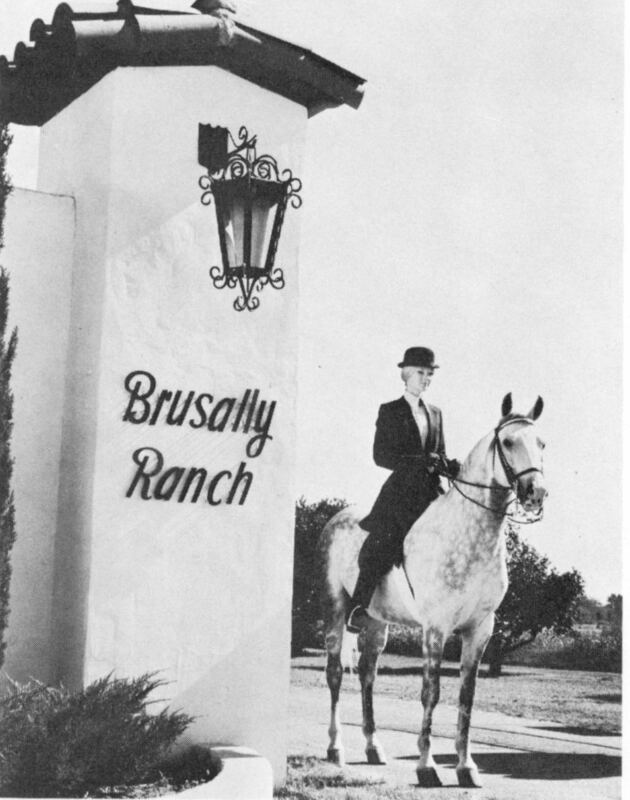 Titled The Polish and Russian Arabians of Ed Tweed's Brusally Ranch, by Tobi Lopez Taylor, the book presents a history of the ranch and discusses Tweed's 27 imported horses individually. Each chapter features a four-generation pedigree, historic photographs, extracts from documents in the Brusally Ranch archives, and an annotated list of offspring. The book will be available through Amazon.com. 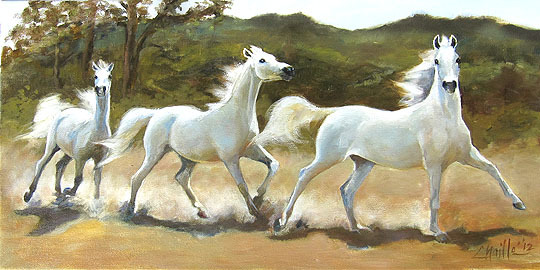 Please visit www.wildemeyer.com to see more of Chaille's paintings.